Since the First One Came Out in 1978! 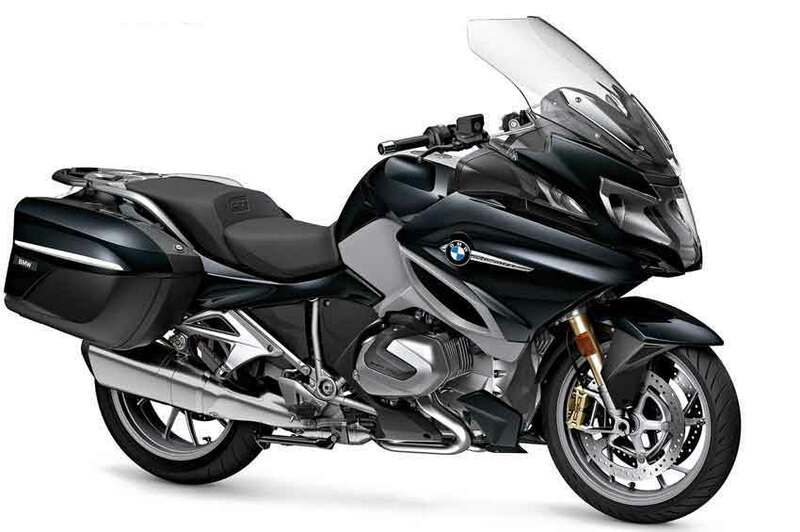 The BMW RT, a motorcycle that has defined the classic touring bike segment since 1978 has been completely redesigned  the 2014-2019 BMW R1200RT. The new RT has a new air/water-cooled BMW 1,170cc boxer engine with 92 lb/ft of torque, 125 bhp, and a traction control system ASC. The standard ride modes "Rain" and "Road" can also be activated at the press of a button, to adapt to weather conditions and road surfaces. An on-board computer, an electrically operated windshield, standard color-matched saddle bags, and heated grips are also basic items. Optional equipment for the new RT include semi-active electronic suspension adjustment, and BMW Dynamic ESA, which responds quickly to changing road surfaces, and shift assistant pro that allows the rider to shift up and down without using the clutch or throttle. A central locking system locks both cases by remote control, a radio, a top case, low or high saddles, a tank bag, and cruise control are available. For the 2015 R1200RT model year keyless ignition and a new color, San Marino blue (see photo above, left) were introduced. The only change by BMW for the 2016 model year of the R1200RT is in available colors — “Platin bronze metallic” has been added. Click here to read the road test of the 2014 BMW R1200RT in the May 2014 issue of Cycle World. • It’s brilliant…a better sportbike than most STs, and a better touring bike than far heavier, less nimble, more expensive bikes. • Fast enough? Yes! Can you bring stuff with you? Yes! Comfortable? Yes! Long-distance capable? Yes! Handles around corners? Yes! All around greatness? Yes, yes and YES! • Yes, it has 20 percent less horsepower than the GTL, but it is also 20 percent lighter…plus, the ergos and wind protection are best in class. Simply a fantastic machine! • More efficient, more powerful liquid-cooled motor, improved styling, traction control, electronic suspension and a host of BMW’s standard convenience farkles make this ultimate distance tourer even better. • BMW has taken one of the best bikes of all time and dropped in a great new engine, bumped the horsepower up to 125, improved the ergos, surprised everyone with clutchless shifting, and put more fun into the ride. What is not to like? • Outstanding balance. Not too big…not too small. Not too sporty…not too focused on touring. Not too heavy. Perfect balance of performance. If you can only have one bike (like most of us), this one is it. • A supreme tourer and a very good sportbike and canyon carver. • Styling, handling, lower center of gravity, new dynamic features like hill start control, gear shift assist, auto stability control, Dynamic ESA. Click here to read about and see the earlier 2005-to-2013 BMW R1200RT models. 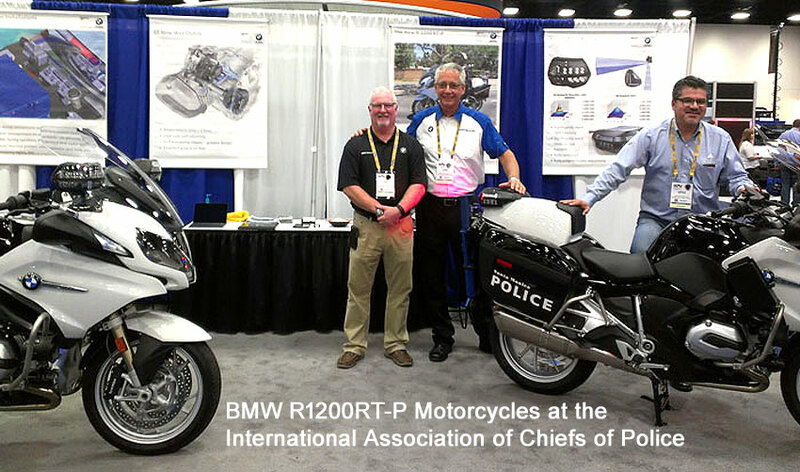 The police, or authority, version of this bike, or the R1200RT-P, and its RT-P predecessors, are the most popular police motorcycles in the world. 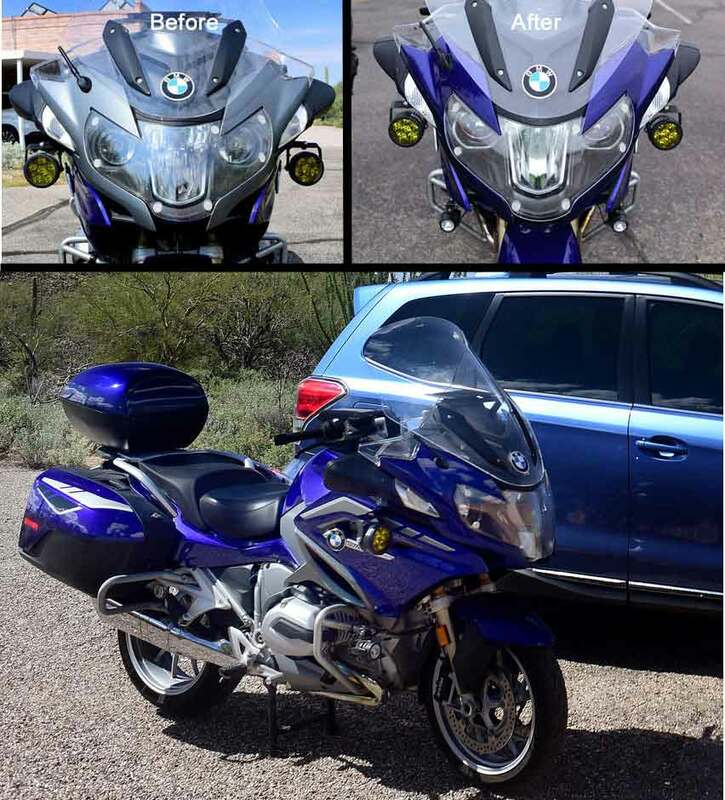 My 2015 R1200RT, in San Marino blue, below, is equipped with a Cee Bailey headlight guard (Cee Bailey no longer sells guards but AeroFlow does), a 28" Werks Quiet Ride (QR) windshield, Russell Day-Long leather saddles, a small BMW top case, painted to match (a large BMW top case is also available). Also installed are BMW's driving lights, and, under the mirrors, Clearwater's Erica LED Lights, and Ilium's front and rear protection bars in light gray finish. From Suburban Machinery I obtained a footpeg lowering kit. 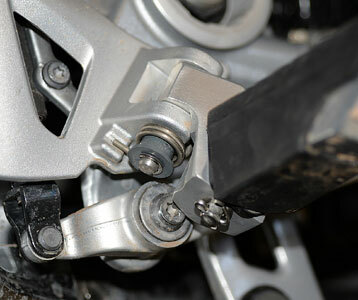 To lower the brake lever after lowering the foot pegs, from Ilium I obtained an adjustable brake lever. I removed the awkwardly positioned antenna because I never use the radio and replaced it with a short one. My blue 2015 R1200RT came with a stock gray “nose” panel. After 2½ years I could no longer stand it and had it painted blue to match the bike's general color (photo below). 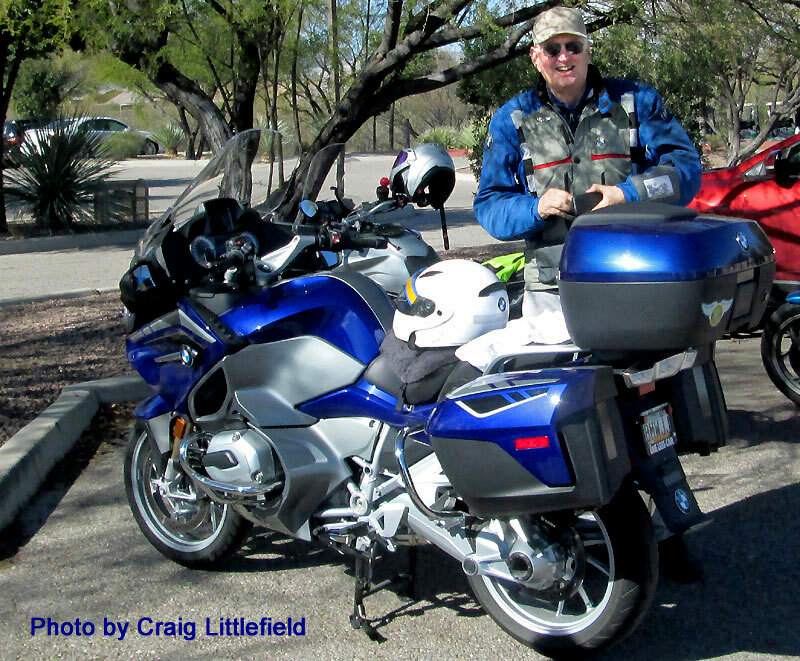 Below: Here am I with my 2015 RT after a lunch with the South East Arizona Touring Riders (SEAT) in Green Valley, AZ in January 2015. Below is Rich Henrion, who lives in the lovely Upper Peninsula of Michigan. 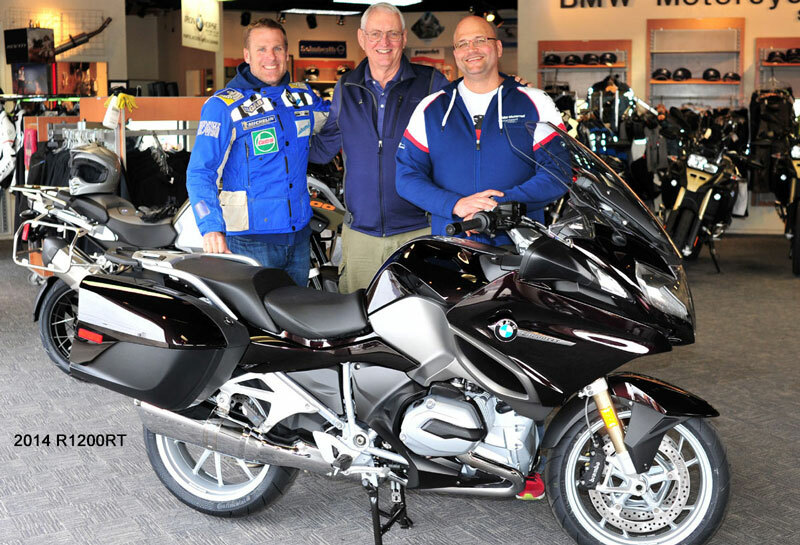 with his brand new 2016 R1200RT, just after he rode it home from the BMW dealer in Green Bay , Wisconsin. He rode it 9,000 miles in his first five weeks with the bike. 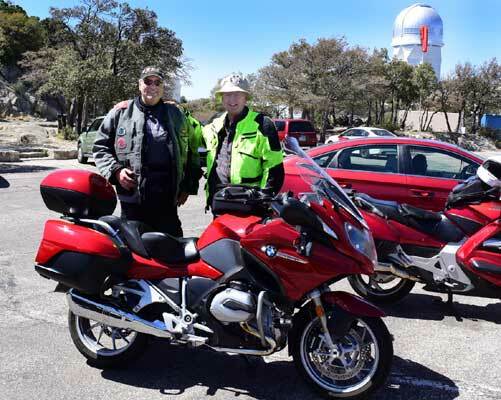 Below: here, left, is Rich with me and my R1200RT, in April 2018 at Kitt Peak, Arizona, and on the right Rich with Lake Superior in the backgound, zeroing in on 24,000 miles. Update: As of August 2017 Rich is up to 41,000 miles and aiming for 50,000 by the year's end. On June 26, 2018, I received a call from Rich. He was in Newfoundland on a long ride on his RT. 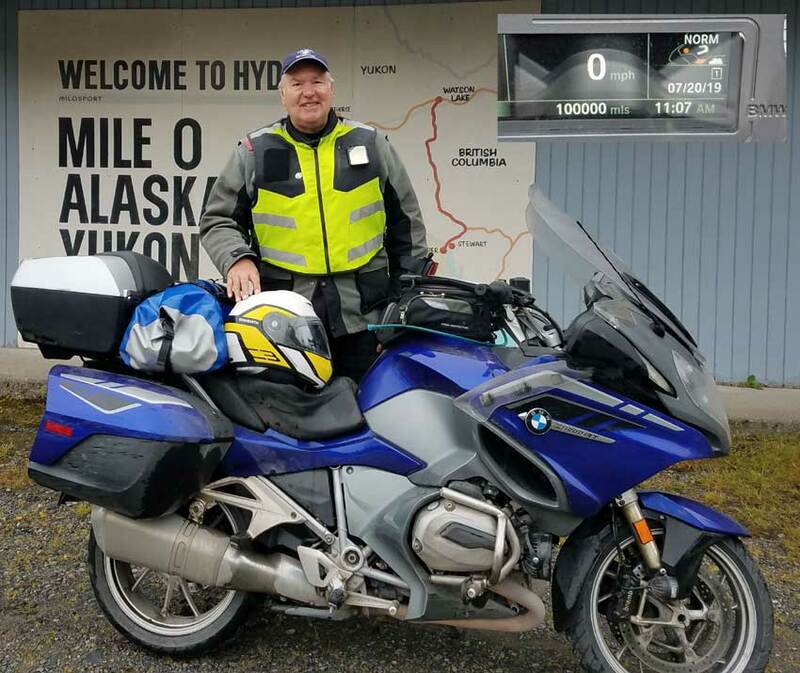 Rich has since reported that he rode his R1200RT over 85,000 miles by the end of 2018. 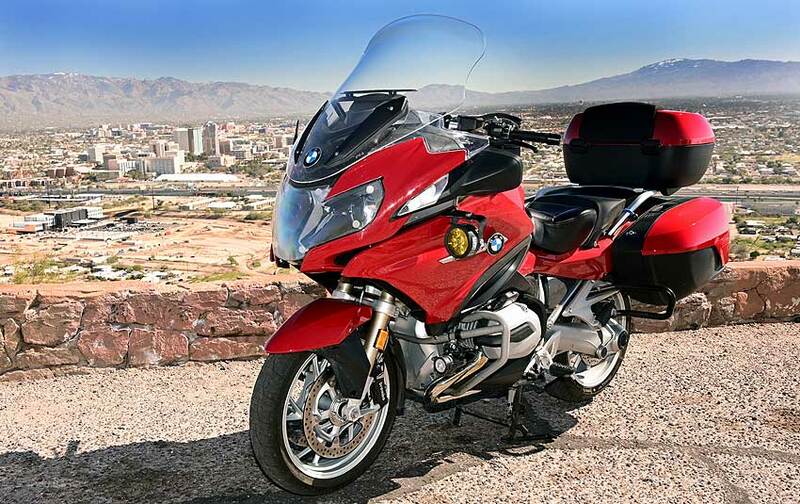 My 2017 R1200RT, in Granada red, below, with downtown Tucson, Arizona, in the background, is equipped with a Cee Bailey headlight guard (Cee Bailey no longer sells guards but AeroFlow does), a 28" Werks Quiet Ride windshield, Russell Day-Long leather saddles, and a small BMW top case. Also installed are BMW's driving lights, under the rear-view mirrors are Clearwater's Erica LED Lights, and Ilium's front protection bars in light gray finish, and rear protection bars. On the rear I have mounted Clearwater's Billie Jr. brake light. From Suburban Machinery I obtained a footpeg lowering kit. To lower the brake lever after lowering the foot pegs, from Ilium I obtained an adjustable brake lever. I removed the awkwardly positioned antenna because I never use the radio and replaced it with a short one. My 2017 R1200RT came from the factory in “Alpine white” coloration (left below). I took this to be a blank slate for whatever color I wanted. I decided on “Granda red” (right below), which is the color on my 1967 R60/2. 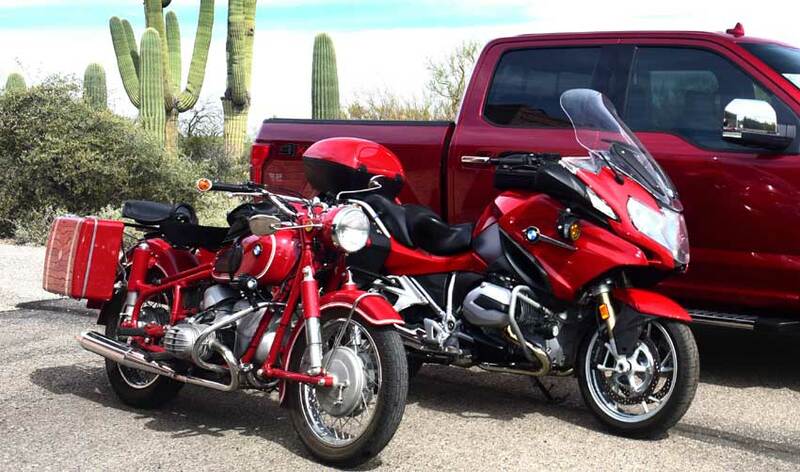 My BMW dealer, Iron Horse Motorcycles, in Tucson, Arizona, accepted my commssion and the R1200RT in the background, with my 1967 R60/2 in the foreground, shown below is the result. Below is the 2019 Spezial Blue Planet Metallic R1250RT awaiting delivery (info below on the 2019 RT models). Many motorcyclists are also private pilots. 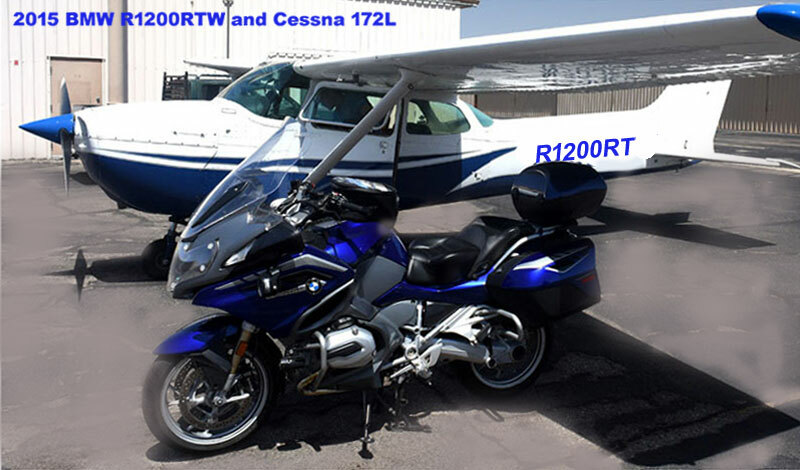 Below is a Cessna 172 behind my 2015 R1200RT in Marana, Arizona. While many RT riders are satisfied with the stock windshield that comes with the motorcycle, some of us, especially tall riders like me, seek different shields. The Werks Quiet Ride (QR) (in the left photo below) is larger than the stock RT windshield. It is taller and wider, carrying its additional width high, and it has a forward flip on top. I use the 28" QR windshields now on my R1200RTs. QR does offer a variety of windshields to fit different riders. Many BMW riders swear by Russell Day-Long saddles. One can ride to Russell at Shasta Lake, Northern California, and have them made while you wait. 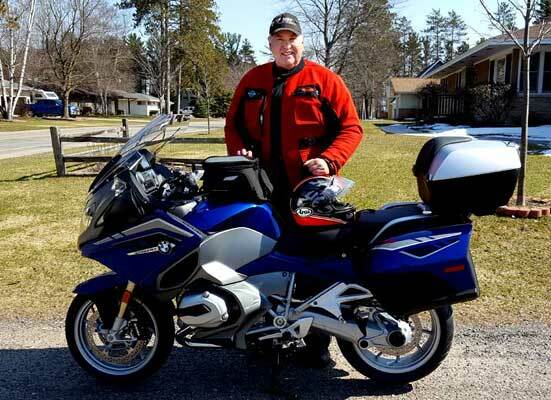 Rich Henrion, who lives in Michigan's Upper Peninsula, has done that twice, one each for two bikes. He is a serious long-distance rider and will not accept any other saddles. Is that too far? Rich rides 2,300 miles, 4,600 miles round trip, to get those saddles. Obviously, the ride home was more comfortable than the ride out. 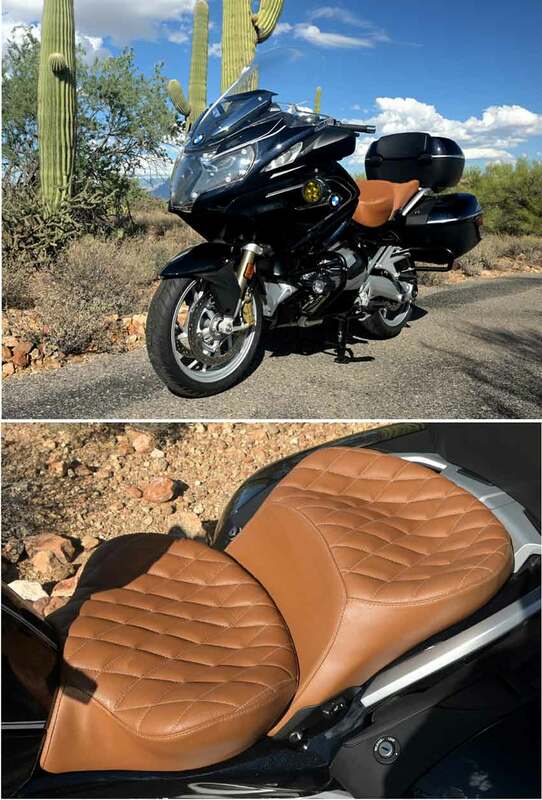 I ordered a pair of these saddles for my 2015 and 2017 R1200RTs and they are pictured below. They are very comfortable. 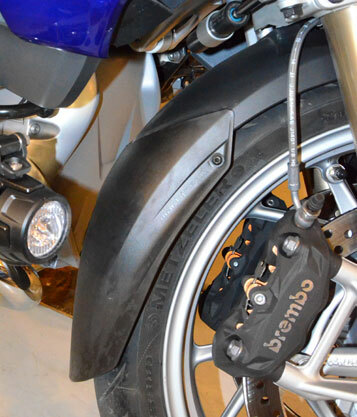 Machine Art Now offers a "no drill" 6-inch front fender extender (below right) for the 2014-2019 R1200RT. 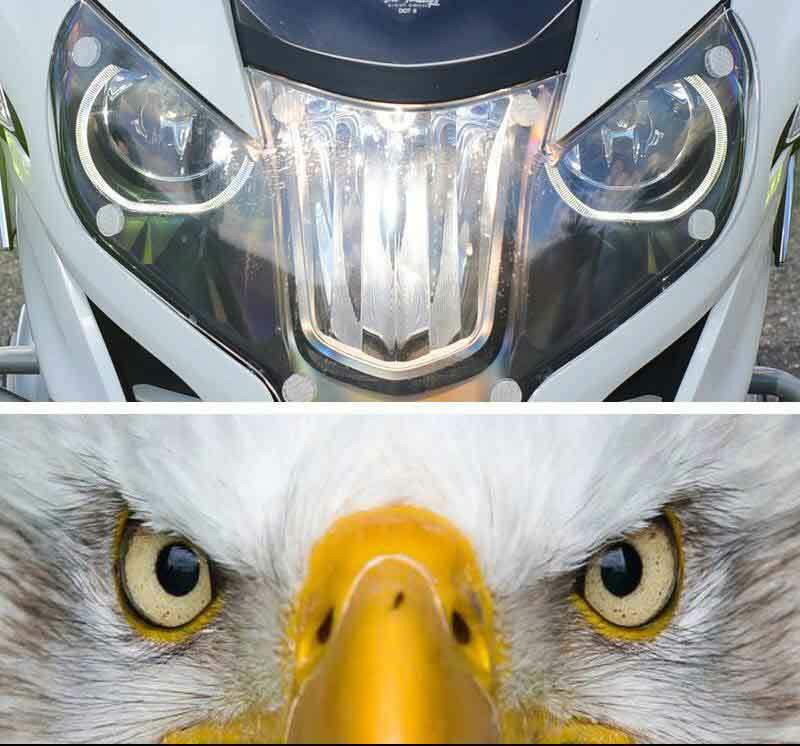 Below, left: German headlight (above) and American eyes (below). Driving light from BMW, below right, helps you to be visible to car drivers. 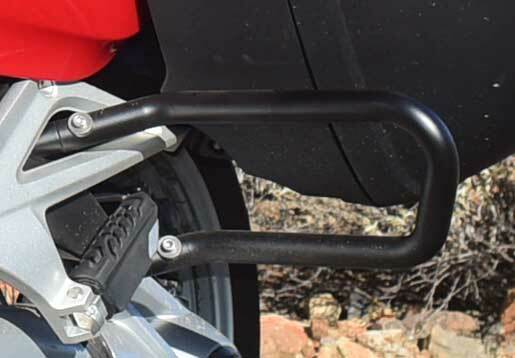 Ilium's black saddlebag protection bar is below, left. It is stronger than Wunderlich's and interferes less with passengers. 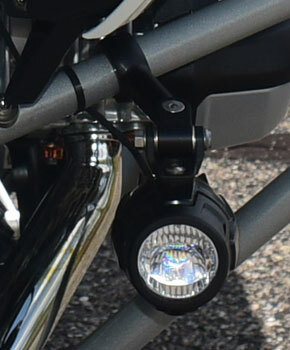 Ilium's engine protection bars (photo below) with BMW's driving lights mounted on them. 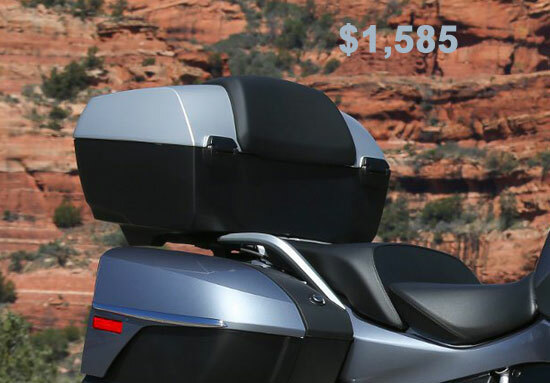 Ilium's gray rear guard bar can be seen in front of the saddle bag. Clearwater Lights offers a variety of excellent and powerful accessory lights for BMWs. 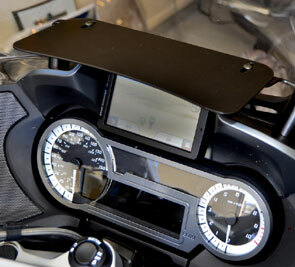 I chose the Erica model with an under-mirror mount (photo below) to get them higher and visible. 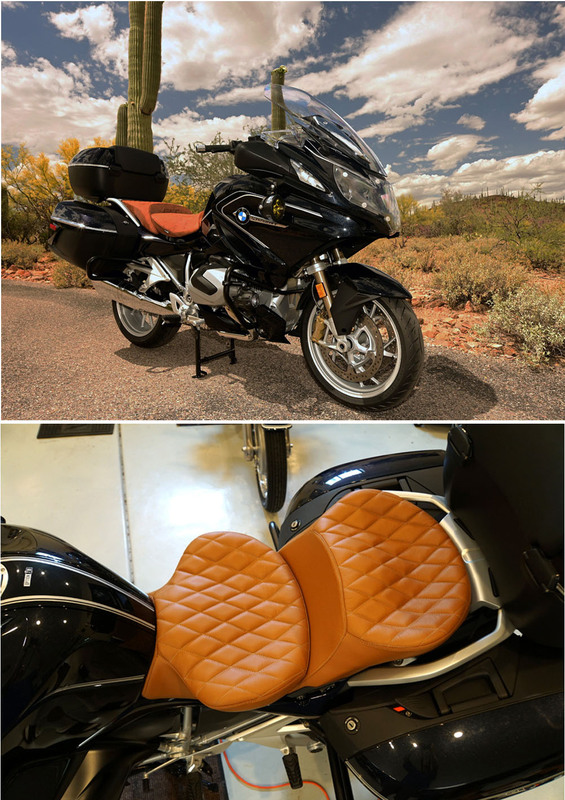 They were mounted for me on my San Marino blue 2015 R1200RT by Grant Guerrero and on my Granada red 2017 R1200RT by Marcus Lund, of Iron Horse BMW, Tucson, AZ. Hyper-Lites are taillights and flashing brake lights that help drivers behind you see and understand that you are braking. On my 2015 R1200RT, mine are mounted above the turn signals (photo below, right). The left photo above shows Clearwater's Billie, Jr., brake lights on my 2017 R1200RT. It is an "intelligent" brake light module that utilizes sensor data carried on the CAN bus. This allows the Billie to read how hard the bike is braking in order to react appropriately to any given situation. The photos below show American personalized motorcycle license plates from Arizona and Wisconsin. There are two BMW top cases that are available for the R1200RT. The smaller case (photo below right) has a capacity of 28 liters (1 ft.³ or 7.4 gallons) and comes with a black lid; the larger case (photo below left) has a capacity of 49 liters (1.7 ft.³ or 12.9 gallons) and comes with a light gray lid. The small case is perfect for daily use. The large case, which will swallow two full-face helmets, is great for packing for long trips. Is it available color matched to the motorcycles? No. Because it presents a large hunk of light gray lid, it surely would be nice if the large case, especially, was available from BMW color matched. Regarding both top cases, the 2013 and earlier cases fit just fine on 2014-2018 RTs. At $832 MSRP the large case is about half the cost ($1,585 MSRP) of a 2014-2018 case, and is lighter. They just have no electric locks, which are offered on the newer cases. The small case is sold by BMW unchanged for the newer and older models. Painting lids to match the color of their motorcycles has to be arranged by their owners. I had my top lids painted to match my bikes, as can be seen in photos below. 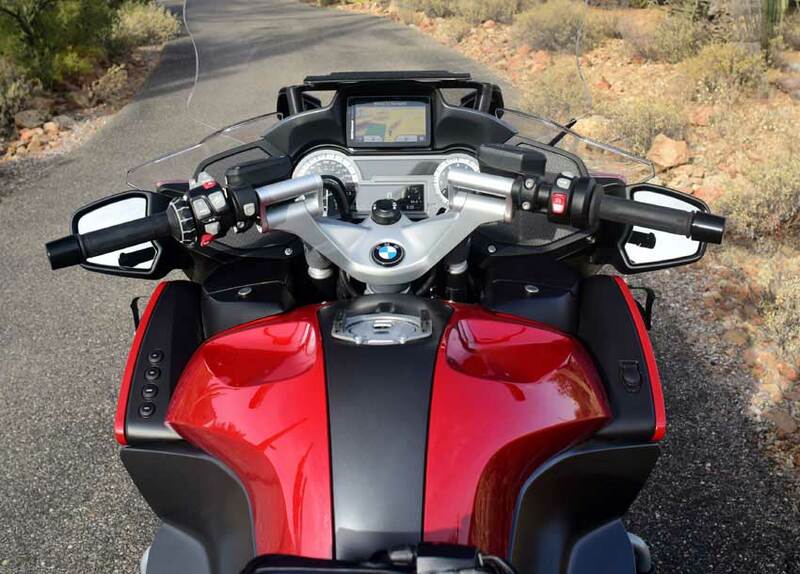 The 2014-2019 R1200RT windshield support arms, below right, seem sturdy enough to not have to be replaced. 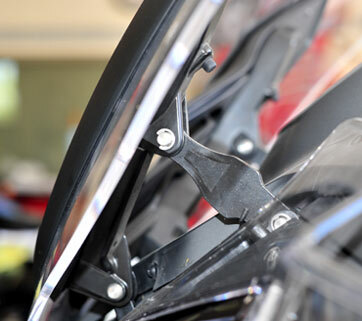 The arms on previous R1200RTs were thinner and prone to breakage when using larger aftermarket windshields. The RCU Shelf (photo above) provides an excellent place for small electronic accessories and provides some shade for the GPS. To increase my leg room a little, I obtained a foot peg lowering kit from Suburban Machinery (photos below). The spring looked intimidating to me. It is not. It is not under compression when the foot peg is down. When you re-install the spring you do not have to compress it. You do have to center it to accept the plastic collar that slides into it. 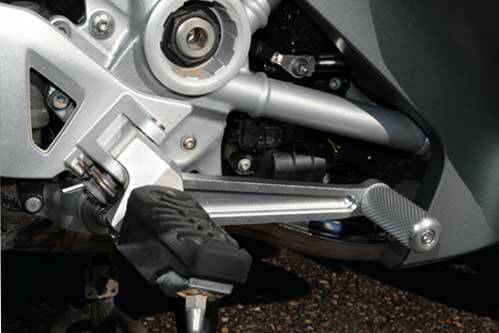 On 2014 and newer RTs, if you want to adjust the travel of the shift lever you can adjust the nuts on a connecting rod that is plainly visible inside the left side foot peg apparatus. The left photo below shows the Ilium adjustable brake lever, which you may wish to obtain to lower the shift lever after lowering the right foot peg. I am a tall rider, so I added Ilium bar backs (below) to bring the handlebars closer to me and higher. In this photo you can also see the large black ignition button, indicating this bike has keyless ignition controlled with an electronic fob with a fold-out key (see inset). I bought an extra fob in case I lose the single one that came with the bike. 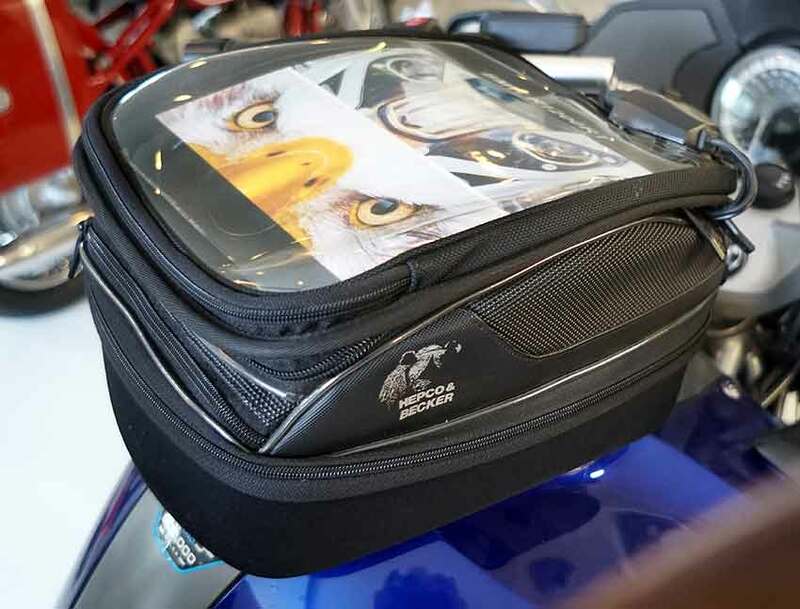 Below is the Hepco & Becker "Tourer M" tank bag for the 2014-2018 R1200RT models These bags come in various sizes and mount nicely with the magnetic "6-bolt pattern Lock-it Tank Ring" around the filler cap. The 2005-2013 BMW RT tank bag mounting grid was much better than the current BMW tank bag as it was easier to remove and put on. The blue 2015 RT below, left, is, to be sure, very pretty, except for the inappropiate gray "nose." The photo of four RTs below shows the blue RT with the appropriately repainted blue "nose." However I have always thought that the RT would be beautiful in red. You can see a 2017 R1200RT beautifully repainted Granada red in photos further up on this page. The 2005 RT in the photo below, right, was available in red for only that one year. Then BMW went back to focusing on various shades of gray for the new "wet head" models. The lovely “Candy Burgundy Smoked” R1200RT in the middle below was available for 2016, but, alas, only in the United Kingdom. 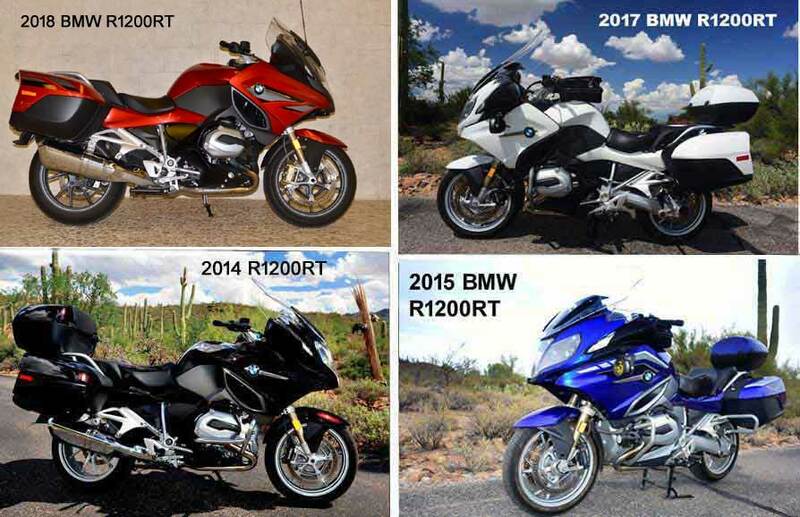 The only change by BMW for the 2016 model year of the R1200RT was in available colors. “Platin bronze metallic” was added (below top left) and the existing paint finish Callisto grey metallic matt is no longer available. When it comes to selecting colors for the R1200RT BMW cannot be called especially adventurous. 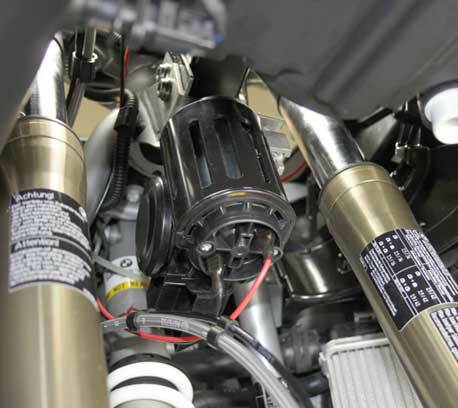 Like the 2016 R1200GS Adventure, all 2017 liquid-cooled boxer models were fitted with a judder (definition: an instance of rapid and forceful shaking and vibration) damper on the transmission output shaft. New features also included a revised selector drum actuator, transmission shafts, and transmission shaft bearing. In addition to these technical changes, the 2017 R1200RT was available with optional ABS Pro, which senses lean angle and adjusts intervention accordingly (as part of the Ride Modes Pro option package). It was also available in two new colors: Carbon Black Metallic and Alpine White (below top right). Ebony Metallic and San Marino Blue Metallic (below bottom right) were no longer available. Platinum Bronze Metallic remained in the program. The only changes for the 2018 model year were colors. The bronze color is gone and in its place is a metallic red color, "Mars red metallic," with a dark slate metallic nose (above, top left), which, as shown here, has been repainted to match the main color of the motorcycle. Otherwise BMW continued with the 2017 changes. The 2019 model year changes were significant, as seen in the Mars red R1250RT, above, right, owned and photographed by William Weldin, Liburn, GA, or the Spezial Blue Planet Metallic, above, left, and two other standard colors carbon black metallic, and Alpine white. The new R1250 RTs came with the 2018 RT's features but became the R1250RT with 1254cc, 134 horsepower (up 11), 105.5 lb-ft of torque (up 13), variable valve timing (VVT), thin-film-transistor (TFT) liquid-crystal displays, and 11 lbs. more weight. Exterior appearance, with minor alterations, came with the same colors as 2018. Changes projected for the 2020 R1250RT model year are not known beyond reports that it will keep the new engine and resemble closely the appearance of the 2019 R1250RT. However, some tweaks can be expected, perhaps in instrumentation and lighting. The next major redesign may occur for 2021, although, IMHO, I do not know how its general appearance could be improved. 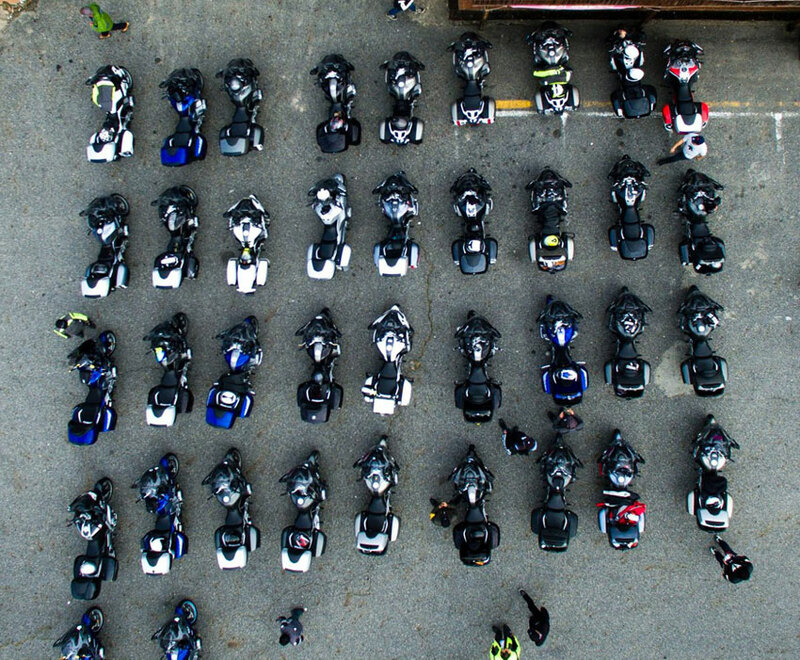 Above: the first meeting of the BMW R1200RT Club in South Korea, in October 2017, brought out 38 R1200RTs and their riders. Internationally, BMW is the largest seller of motorcycles for authority use. More than 80,000 BMW motorcycles are currently in official use in over 150 countries on five continents. 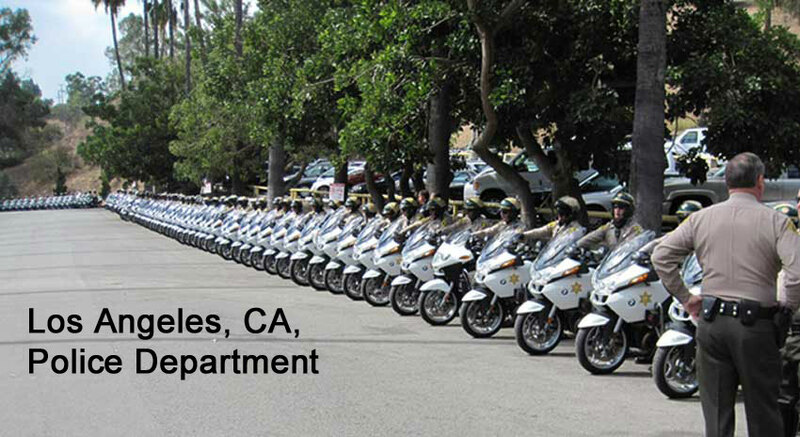 In the United States, 550 law enforcement agencies, including the three largest US fleets, which are operated by the California Highway Patrol, Los Angeles Police Department and Los Angeles Sheriff’s Department, have BMW authority motorcycles in their fleets of patrol vehicles. 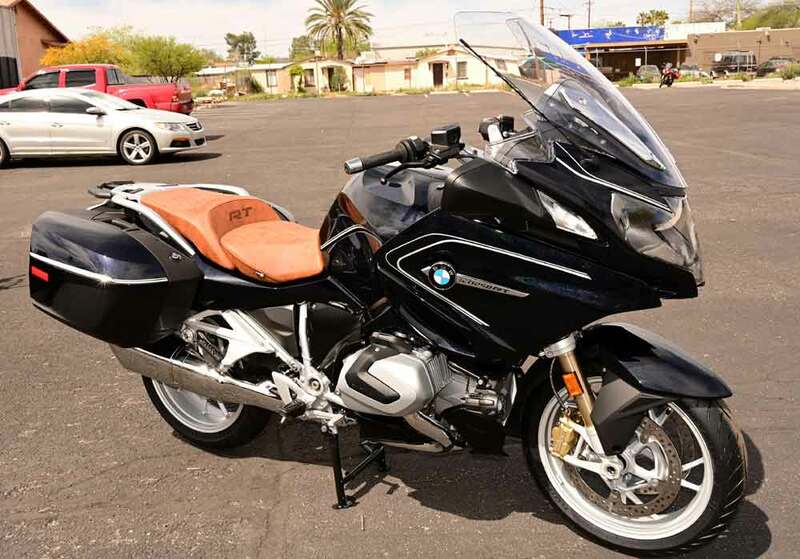 Below is an 2015 BMW R1200RT-P police or authority verson of this bike. The BMW RT-Ps are the most popular police motorcycles in the world. 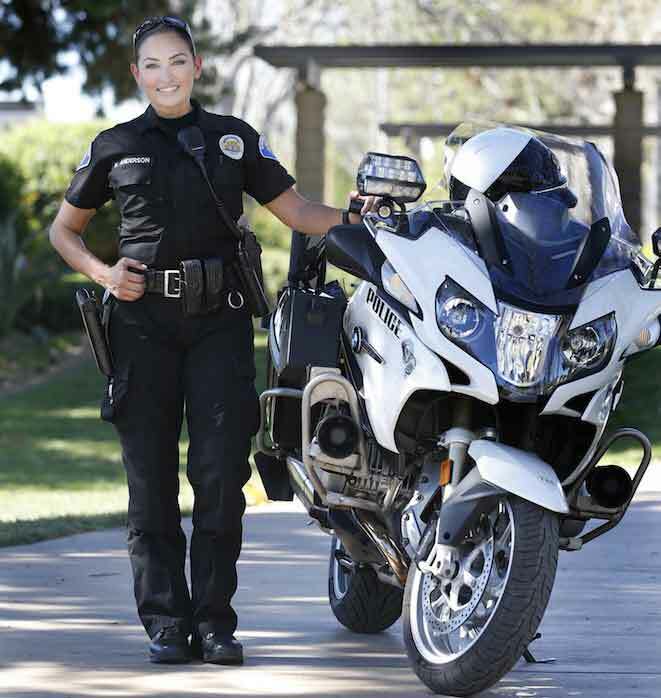 Below is Garden Grove, CA, Police Department motorcycle officer Katherine Anderson. 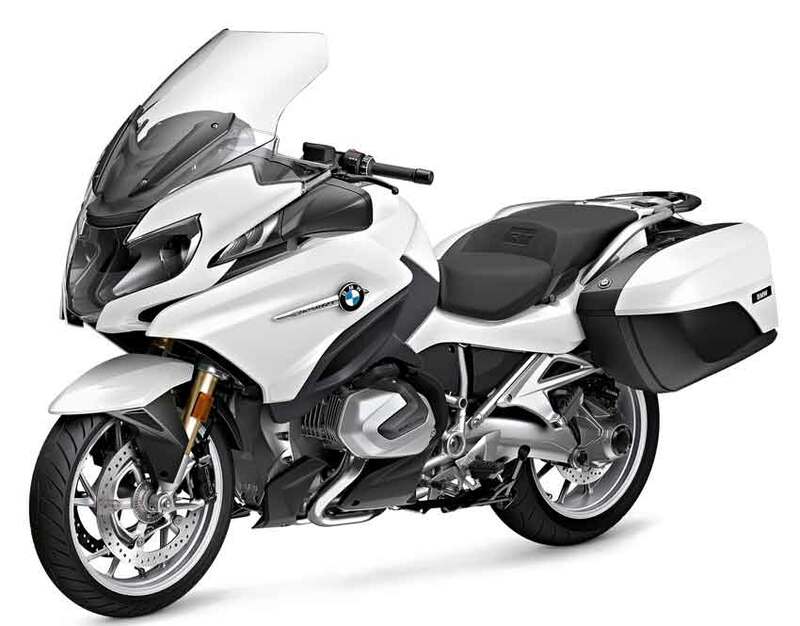 2014 — 2018 BMW R1200RT specs are here. 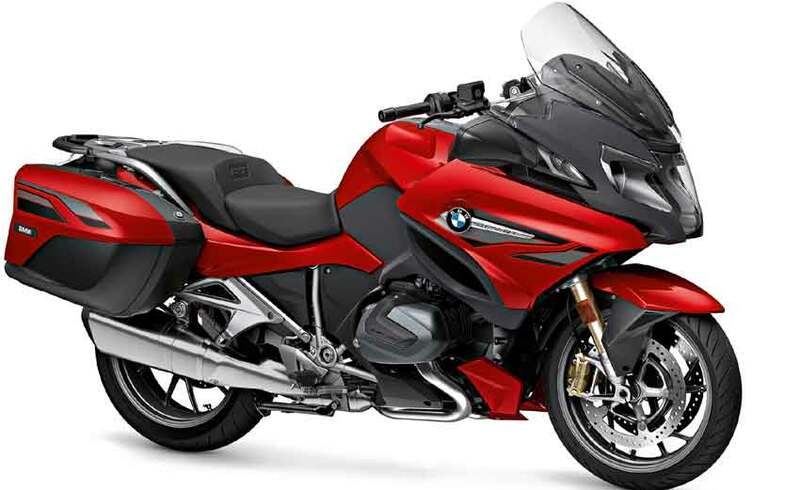 2019 BMW R1250RT specs are here. 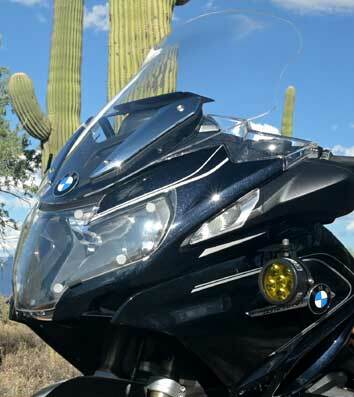 BMW Motorrad USA has posted somewhat current R1200RT information here.